Castle Comfort Stairlifts offers top brand stairlifts, keen prices and fast installs for all those seeking stairlifts in Aidrie, Lanarkshire . And all work comes with our no-quibble guarantees and famous customer service satisfaction. Airdrie forms part of the Monklands area with Coatbridge. Airdire is just 12 miles from Glasgow and still acts as a commuter town for this city. It also has a number of satellite villages of its own. These include Airdriehill, the old mining village of Chapelhill, Calderbank where the first iron boat, Vulcan was ‘born’, Caldercruix known for its mining and papermaking, Greengairs, Longriggend, Upperton and Wattston. Monklands was named after the Cistercian monks who founded the New Battle Abbey and farmed the local land back in the 12th century. Airdrie is built on a plateau some 400 feet above sea level. This is relevant as the monks were good at building roads – little more than tracks in those days. In fact the original main road between Glasgow and Edinburgh ran through Airdrie. Roads on high ground were popular as they were less boggy and more open so travellers weren’t so prone to ambush by robbers. They became known as ‘the high way’ and later the King’s Highway. Airdrie’s highway was where its first houses were built too. Like its close neighbour Coatbridge many of Airdrie’s ancestors were Irish immigrants who came over to work in the mines. Castle Comfort Stair Lifts can’t make similar claims but they can make sure you can still reach all parts of your home. We have been in the stairlift business for 15 years supporting individuals and families who need mobility help to climb the stairs. With a slightly smaller population than Coatbridge, Airdrie also has a smaller retired population and slightly less stairlift owners, around 180 to be exact. Check out our website homepage to see our scrolling counter which records stairlifts as they are installed! 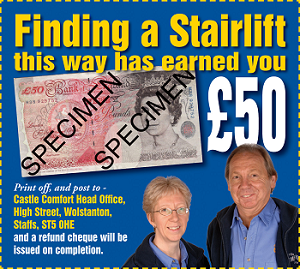 With so many years’ experience and a great 24/7 after service, we can advise you about the make and sort of stairlift which will suit you. But first, why not check out what other owners have said about us and compare prices and the benefits of the many different types. If you still have questions, please give our local office a call on 0141 278 3929. Airdrie’s professional football club is Airdrie United FC and are currently managed by Jimmy Boyle who started his career playing for Airdrie United. They are also known as the Airdrieonians and the Diamonds due to the red diamond on their white shirts. Without even naming all the players who were born in Airdrie over the years, we wonder if this is a record for one town? As well as Airdrie’s professional club they have several teams playing in amateur leagues. They also have a Rugby Union Team, Waysiders RFC, as wells as 6 local bowling clubs! Airdrie is thought to have been given its name in reference to its location, from the Gaelic that means ‘high hill pasture’. It sits on what is known as the Hog’s Back, a high land ridge that runs from East to West. Modern Airdrie is considered to have been founded in the 17th century by Sir Robert Hamilton who was Laird of Airdrie House which unfortunately no longer exists. Monklands Hospital stands on its former site. Already a thriving market town, the lands around Airdrie grew flax so the town grew up as a weaving community; then by the end of the 18th century coal had been discovered and coal mining became important to Airdrie too. At the end of the 19th century, Airdrie’s Public Observatory was built in the library. This observatory is one of only 4 that exist in the UK; it is the second oldest. The original telescope was a 3inch refracting one donated by Glaswegian Dr Thomas Reid. Although this telescope is no longer in use, you can still see it at the observatory. The main telescope now is the Cooke, a 6 inch refracting one which can track the stars across the sky. The telescope provides magnification up to 450 times. Even this telescope is believed to be more than 100 years old. The observatory has a number of small reflector telescopes too. There’s no doubt that Airdrie has a long line of famous personalities. But locals no matter whether they are ‘known’ or not deserve to retain their independence wherever possible. 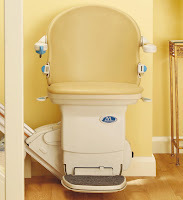 That’s why Castle Comfort Stair Lifts go to no end of trouble to make sure you know about the services we offer. If you or a loved one in the area needs some mobility help, we’re here to assist. We have a wide range of stair or chairlifts to accommodate everyone. Take a look at some of our different types: straight, curved and perch for those who have trouble bending their knees. Remember that we also have reconditioned ones too. If you’d like to make the purchase easier, take a look at the grants on offer or consider a 0% finance deal. If we haven’t answered all of your questions here or on our website, please give our local office a call on 0141 278 3929 . Our team will be more than pleased to help you.